I'm introducing a new feature here, something I'm calling "The Jack Sack Movie Classics." As many of you have come to realize, I'm a film fan- and in this series of articles, I'll be sharing thoughts on my personal favorites- and hopefully spur some discussion with you as well. 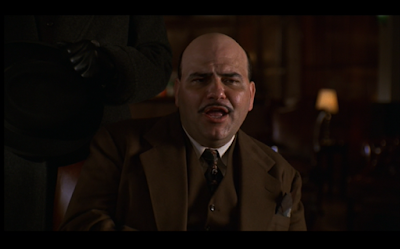 Don't give Johnny Caspar (Jon Polito) the "high hat!" First in this series is MILLER'S CROSSING, the 1990 Irish-gangster film from Joel & Ethan Coen. Well, the TV guide will tell you it's a gangster film, but MILLER'S CROSSING is a deceptive movie. Tom (Gabriel Byrne) is lieutenant to New York's most powerful mob boss, Leo O'Bannon (Albert Finney). There's a world of lies, greed and betrayal that engulf these two men-- and by the film's end they are given a choice: to either remain in that life or move onto something different. One of the great things about this film is that all of this deep soul-searching stuff isn't the focus of what's taking place onscreen. Instead, MILLER'S CROSSING is a highly active story- pulling in characters (and I do mean "characters") from a very diverse collection of gangsters, politicians, thieves, cops, freaks and even the genre-requisite femme fatale. The story can get pretty dense in places only because so much is going on. Tom is into a large debt with a bookmaker, he's fooling around with Leo's girlfriend, he has to choose if this girl's brother, Bernie Bernbaum (John Turturro) should live or die, he's being squired by a rival gangster, Johnny Caspar (the brilliant Jon Polito), and he's being scrutinized by Capsar's muscle guy, The Dane. I'll be honest, it took me two viewings to really soak up everything that's happening in Tom's world. But I think things are complicated on purpose, so that we emotionally identify with Tom's bewilderment, which is well-hidden by his very droll, placid demeanor. The more some people get overwhelmed, the more calm and whimsical they act- that's old-school tough-guy stuff that this movie examines both critically and with a little romantic appreciation. What separates this movie from a lot of other gangster films is something that on its surface makes it the quintessential mob flick- its dialogue. The script is full of gangster slang- there are words in here that you've probably never heard of unless you lived during the 1920s. Compare this to a movie like 1987's THE UNTOUCHABLES, and you'll see what I mean about the dialogue. THE UNTOUCHABLES feels like an '80s movie, even though it is very much involved in its Prohibition-Era setting. MILLER'S CROSSING doesn't try to make itself modern. It is devoted to its period, so much so that some of its most brilliant lines can be lost on an audience that is not intently listening. But if you do pay attention, you will see the humor and complexity of these characters. That's what continues to draw me back to this film- each time I watch it, I find something new to consider. If you've seen MILLER'S CROSSING, jump in and comment on what you think of the film. If you haven't seen it yet, I think it would be the perfect movie to watch on St. Patrick's Day later this month. As the first film in this ongoing series of "Classics" I highly recommend it as one of my all-time favorites. My kind of movie. Excellent review. I can't imagine why I haven't seen it. I think MILLER'S CROSSING just never sounded like a gangster movie. Anyway, it's available to play now on Netflix so I might watch it today. That's great- whenever you get around to it, I'd love to know what you think of the movie. Be prepared for a lot of comedy too. It was great. I'm glad you recommended it and I'm glad you gave that video clip because it was slow starting but I knew it was going to get faster paced. I'm very happy you enjoyed it. You're right, it is a slow movie to start. And one of the challenges with the beginning of the film is that Tom, Leo, etc. are talking about characters we haven't met onscreen yet. That aside, it's a unique (almost quirky) gangster movie. I'm glad you think it was great! 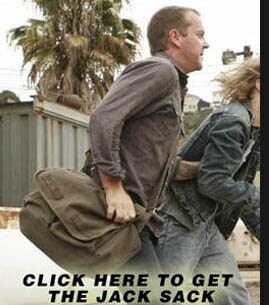 Nothing more foolish than a man chasin' his hat. Excellent first installment! Miller's Crossing will always have a special place in Rickey's heart--it's the perfect lazy weekend movie. Rickey's talking about ETICKS! @Pelty- how about the dialogue about "Rug" turning up dead? LEO: Did you hear about Rug? TOM: Yeah, rest in peace. LEO: They took his hair, Tommy. Jesus, that's strange, why would they do that? TOM: Maybe it was injuns? The movie's screenplay is a treasure trove. @Rickey- ya know, you still have writer's privileges at "The Jack Sack" so feel free to start your own Rickey's Movie Classics series too. I'm looking at the post-24 future of this blog and I see you in it, old friend. Let's talk about it this weekend. What's In Your Jack Sack? 24 Season 8: CTU Is Powerless! BREAKING NEWS: FOX to Cancel "24"
©2006-2013 Adam Cohen. All Rights Reserved. THE JACK SACK is a trademark of Adam Cohen. This blog is not endorsed, sponsored or affiliated with FOX or its related entities.